At 37’11”, the 370EX is the flagship of Rinker. The 370EX stands as a timeless classic with all the benefits and comforts you expect, paired with an astonishing 6’11” of cabin headroom. Cruiser enthusiasts will appreciate amenities to enhance their boating experience on extended getaways. Dual Side Shore Power connections make visiting guest marinas convenient. The head in this boat features a separate walk-in shower. Bring outfits for all occasions and keep them fresh in dedicated garment closets. A standard generator, two refrigerators, ice maker, freezer, two-burner stove, microwave, and a spice rack ensure you have all the necessities for a gourmet dinner above or below deck. A private forward stateroom is a popular option for couples getaways or family outings. The two-person captain’s seat puts you in charge. 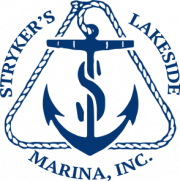 Digital controls, chart plotter, compass, digital depth gauge, and LED trim tab controls are standard features. The optional joystick control systems makes docking easier and safer. The 370EX is the best value for boaters looking for a home away from home.